We sell good quality genuine antique furniture which has been sympathetically restored, by professional antique restorers, to maintain the integrity and value of each piece. This rare antique ormolu occasional table is made from cast brass which has been gilded to add gold to the surface. The casting is very detailed and some of the original gilding remains in some areas despite its age. Antique French Louis XV Style Kingwood Chest of Drawers or Antique French Kingwood Chest of Drawers or Commode. 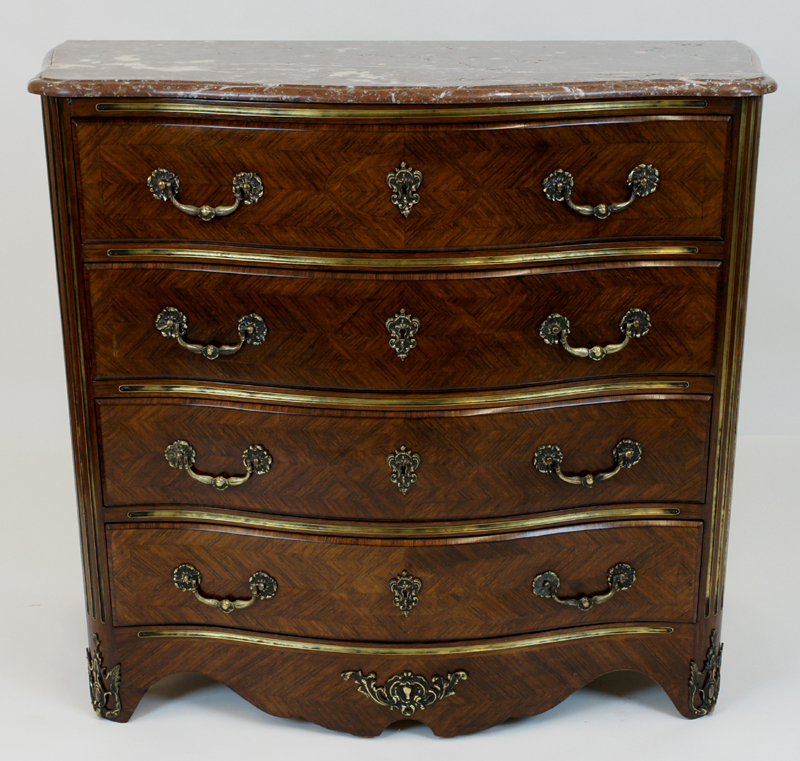 This very good quality antique French commode, or chest of drawers, has a lovely serpentine shape to the front and the sides. It is veneered in kingwood with chevron crossbanding in a parquetry manner. 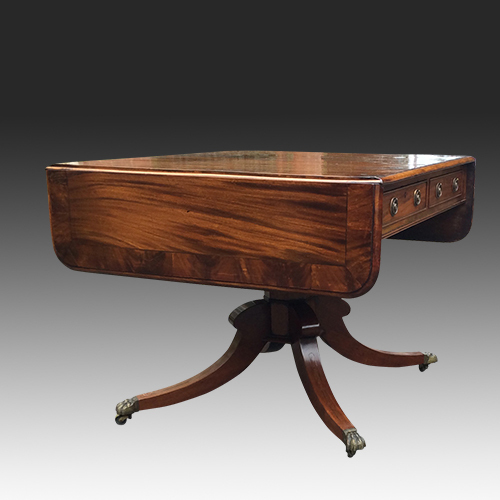 This good quality antique Regency sofa table has well figured solid mahogany and cross-banded top. The top has a 'bull-nosed edge and drop flaps to either end supported by the original adjustable supports. This fabulous antique carved occasional table by Robert Strahan is carved from solid walnut table. It is in fantastic original condition with beautifully carved detailing. It has an inset of figured marble top in shades of cream and ochre surrounded by a crisply carved border of flowers and foliage. This beautiful English marquetry dumb waiter was made in the early 19th Century English Style. It has three circular cabriole legs terminating in pad feet with steel and leather castors. 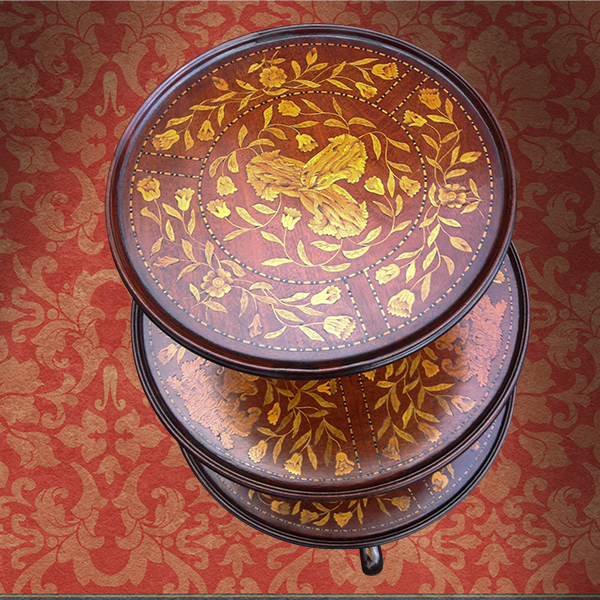 The whole is covered in finely executed and exquisite Dutch marquetry. The top has a centre of ‘parrot’ tulips surrounded by a band of flowers. 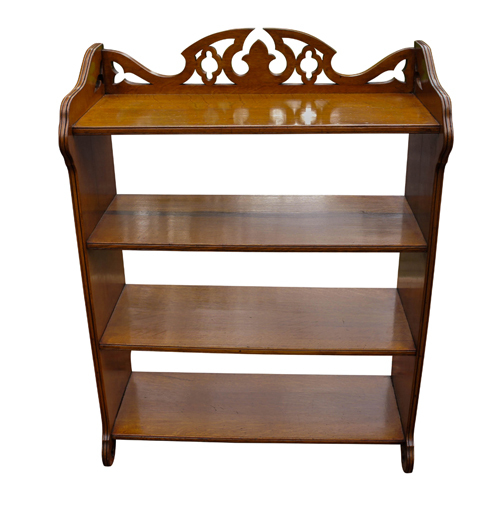 This freestanding antique oak open bookcase was made in the Gothic Revival Style of the mid-19th Century in the manner associated with A. N. W. Pugin. The shaped sides show the exposed tenons of the top and bottom shelves and at the front, the lower edge has a trefoil cut from the timber.